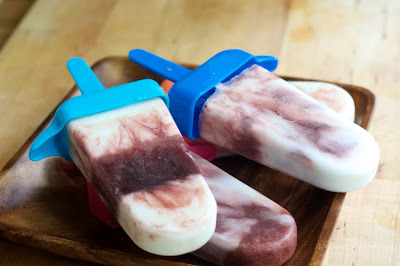 Cherry Yogurt Popsicles | Naturally. As food goes in hot months, I grill a lot and I eat ice cream. I really eat more ice cream than I probably should. So when I saw these Popsicles, I knew I had to try them. With the only ingredients being juice, yogurt, and honey- you really can’t go wrong and I don’t have to feel guilty “scarfing” down these. Even better? Super simple to make. In one bowl, combine the water and cherry juice. In a separate bowl, combine the yogurt, honey, and milk. 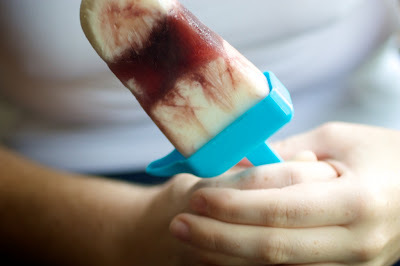 If you don’t want to wait for the layers to freeze, do the layers all at once, use a skewer to swirl, place a stick in the molds, and freeze overnight. 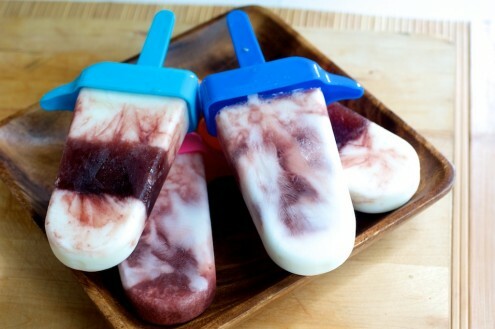 These are beautiful cherry popsicles! Love the layers. These look great as an afternoon healthy snack for the kids. I wonder if you put a little bit of lime juice if it will be like a cherry limeade? Maybe- I’ve not tried but it sounds good to me!